We began our first morning in Dubrovnik with a walk to the Old Town area, which we spent most of the day exploring. Along the way we were treated with a series of awesome views of typical Adriatic coastline below us; beautiful blue water colliding with light tan Dinaric limestone and dark green stone pines. Entering the Old Town gates it’s hard not to feel charmed by the narrow cobbled lanes, marble squares and the general picture of municipal medieval life the whole scene is able to render. 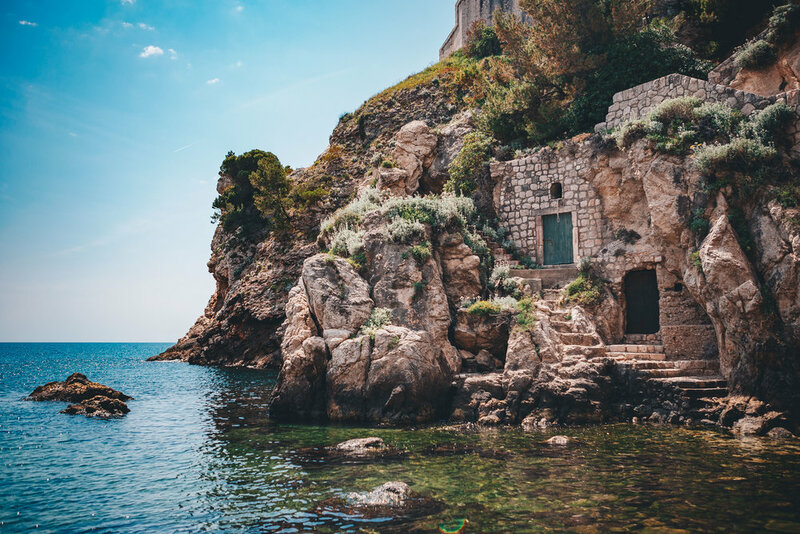 In an area of the world famous for its old towns, its pretty clear that Dubrovnik reigns king of them all because of its size and exquisite preservation and restoration. Dubrovnik has also gained popularity due to its role as the setting of city of Kings Landing in the HBO series Game of Thrones. Many organizations offer tours specifically focused on locations used in the show. The first image featured above is a cool little bay side staircase that was used for a scene in one of the earlier seasons. We spent the rest of this memorable day wandering the endless labyrinth of narrow, shop-lined avenues in search of other familiar locations from GOT.